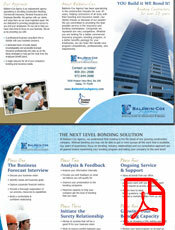 At Baldwin-Cox Agency, we understand that bonding is the life blood of any growing construction company. Without bonding you may not be able to get or even pursue all the work that is available. Our years of experience, focus on bonding, industry relationships and our consultative approach are all geared toward maximizing your bonding program and taking your company to the next level! 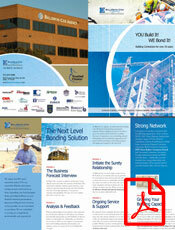 Bid Bonds - A Bid Bond is issued by a bonding company, also referred to as the surety, on behalf of a contractor. It provides assurance to the owner that if awarded the job; the bidder will enter into the contract and provide the required payment & performance bonds. Performance Bonds - A performance bond provides an owner with a guarantee that their construction project will be completed per the terms of the contract. The performance bond is issued by a bonding company, also referred to as the surety, on behalf of a contractor. Payment Bonds - A payment bond is posted by a contractor in order to guarantee that its subcontractors, laborers and material suppliers on the job will be paid. The payment bond can be written in conjunction with a performance bond, or can be issued as a stand-alone bond. Maintenance Bonds - A maintenance bond, also known as a warranty bond, protects an owner against defects on a completed project for a specified period of time. The warranty period is usually just one or two years after completion of the project, but in can be longer depending on the owner and the type of project. Supply Bonds - A supply bond provides a guarantee that a supplier will provide the materials required by their purchase agreement. The obligation is fulfilled once the supplies are delivered. Subdivision Bonds – A subdivision bond, sometimes called a Developer bond, is a guarantee that the contractor will complete the work that ties into public streets, roads, sidewalks, utilities or sewer lines. It’s basically a performance bond related to the scope of work that affects public infrastructure. This bond is for the protection of the public entity, but depends on private financing so they’re more challenging to get approval than a typical performance bond. We have markets that specialize in this type of work and have had success with these type of bonds.